Multiflora Rose (Rosa multiflora), is a species of rose native to China, Japan and Korea, but also present in other parts of the world as an invasive weed. It is particularly problematic for wooded areas and meadows because of its dense growth and copious thorns which make removal difficult. It is a scrambling shrub climbing over other plants to a height of 3-5 m or sometimes higher in trees, with stout stems with recurved thorns. The leaves are 5-10 cm long, compound, with 5-9 leaflets and feathered stipules. The flowers are produced in long panicles, each flower small, 1.5-4 cm diameter, white or pink, borne in early summer. The hips are reddish to purple, 6-8 mm diameter. In eastern North America, Multiflora Rose has become an invasive species, though it was originally planted as a soil conservation measure and as a wildlife attracting plant. It is readily distinguished from American native roses by its flower or seed heads, which bear multiple flowers and hips, often more than a dozen, while the native species bear only one or a few on a branch. Over time this plant has become a serious ecological problem because of its ability to grow in diverse light, soil, and moisture conditions, and because its seeds are widely broadcast by birds. Once established, it forms nearly impenetrable thickets that displace native understory plants and can become a fire hazard in wilderness areas. Some places classify Multiflora rose as a "noxious weed". In grazing areas, this rose is generally considered to be a serious pest, though it is considered excellent fodder for goats. 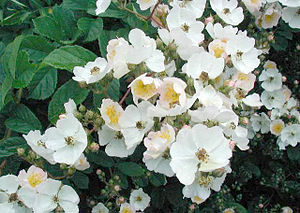 Multiflora Rose is grown as an ornamental plant, and also used as a rootstock for grafting ornamental rose cultivars. Because of the thorny, tough nature of this plant, heavy equipment duch as tractors or backhoes are often employed where possible. Pulling: Pulling is effective, though thorns make it difficult. Thorns may be simply removed from the lower part of the stems to allow for a good grip. Flame: Controlled brush fires will burn the plants down, but does not kill the roots. Grazing: Goats avidly graze on multiflora rose, and are an effective control over the long term. Disposal: Chipping is not recommended because the curved thorns easily grab clothing or skin as they are pulled into the chipper. Composting takes a considerable amount of time unless chipped or shredded. When dry, multiflora rose is extremely flammable, and so should not be burned during very dry periods. During the winter months, multiflora rose can be used as a brush hay for goats. "Multiflora rose". U.S. National Park Service. http://www.nps.gov/plants/alien/fact/romu1.htm. Retrieved March 27 2006. This page was last edited on 20 May 2009, at 15:49.